Greetings citizens! We have the domino deluxe, which has treated us very well indeed as we cook just about every day. This week we received, in no particular order, scallions, basil, celery, lettuce, cubanelles, yellow squash, radishes, tomatoes, corn, plums, peaches, blackberries, & eggs. Our share family is Ben, Carrie & Sgt. Snuggles (the furry one above). 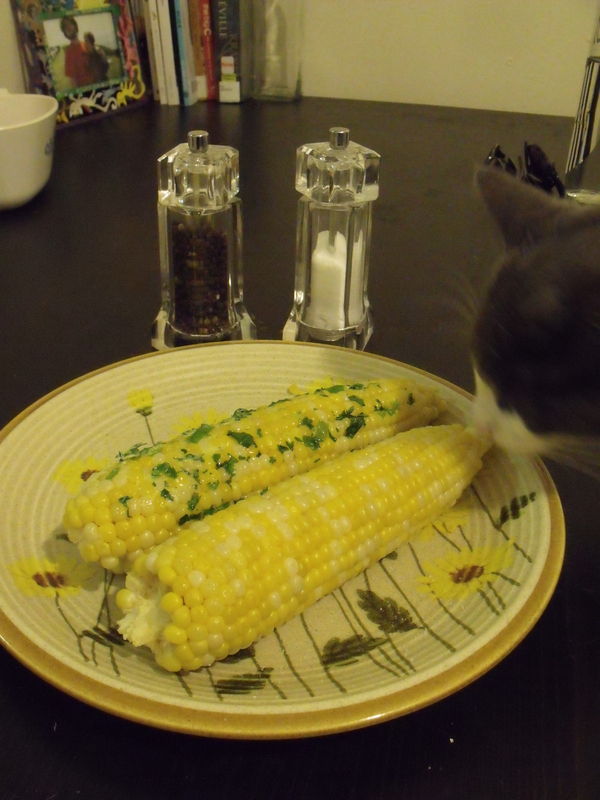 One of our many important CSA traditions is to immediately consume any and all corn we get. The sugars in corn start turning into starches as soon as you pick it off the stalk, so corn is best the sooner you eat it. We boiled ours for just a couple minutes, between three and four, depending on how attentive we’re being, and then scarfed it down with scallion cilantro butter (easy herbed butter recipe here). We rarely feel the need to do more with the corn than that. It’s just that good. 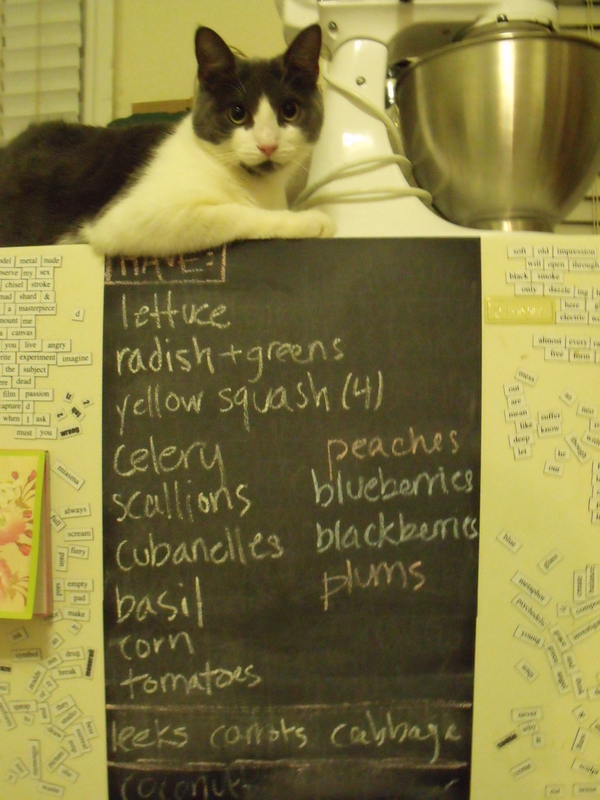 Upon finishing that first meal we cataloged our bounty on the refrigerator chalk board (you can buy these stickers at the MoMa design store, btw. They’re removable and really fun). We find one of the biggest challenges of the share is remembering what we got. So we list it all, and then erase things as we use them. 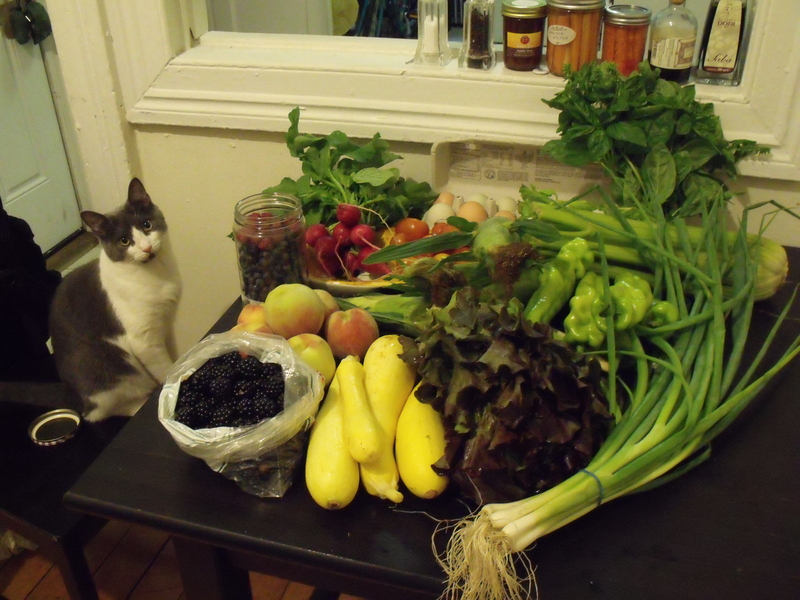 This is our second year at the CSA and we have definitely improved our SPLR (spoiled produce loss rate). This technique makes the meals that use the most ingredients the most satisfying. 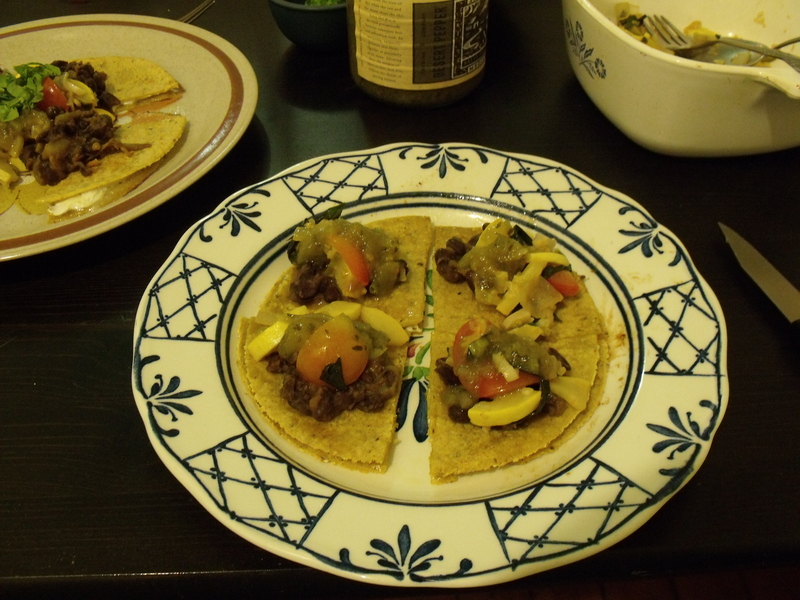 Thus, with no further ado, taco night in which we used squash, cubanelles, basil, tomatoes, scallions, & cilantro & onion (from last week). 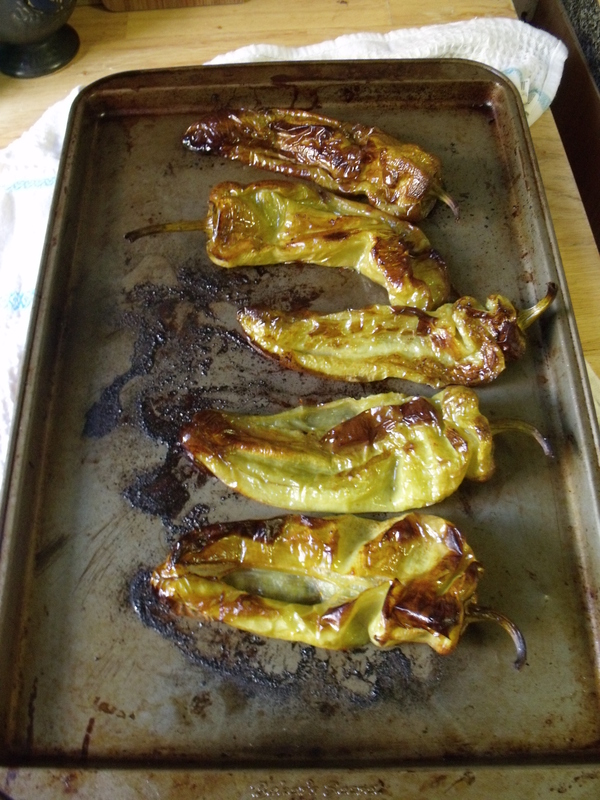 First thing was to roast the cubanelles, which makes them smoky and brings out the sweetness. 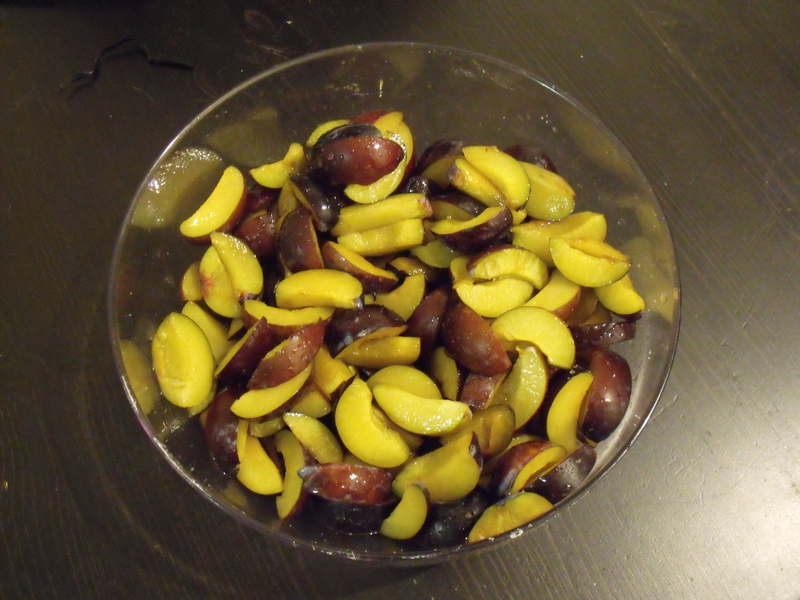 We coated them with a bit of olive oil and baked them at 450 for between 20 and 30 minutes. Meanwhile, the black beans (soaked since that morning) were simmering with a couple leaves of epazote (frozen from the last time we got it) and I got to prepping the summer squash, onions, basil, & tomatoes. We tossed those all together and cooked them for a few minutes with some homemade veggie stock (just til the squash was tender but not squishy). 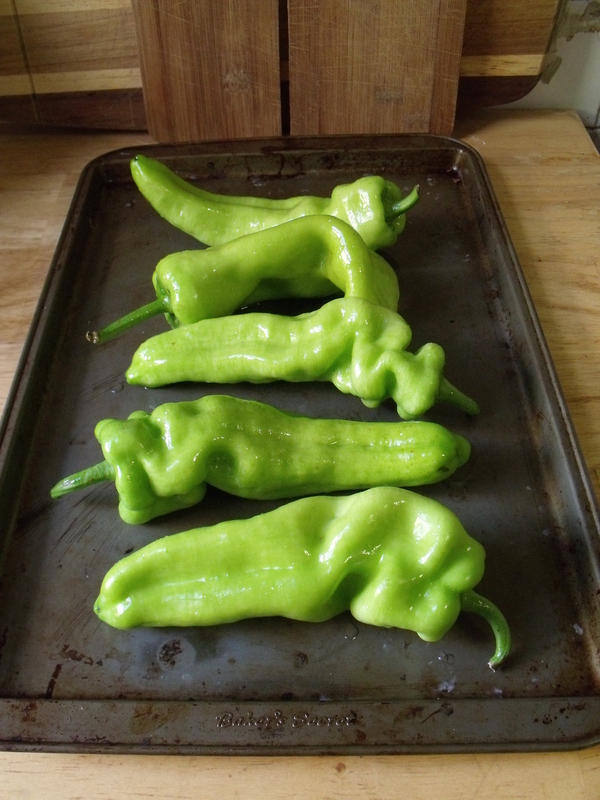 Once the cubanelles were roasted we let them cool for a couple minutes and then peeled the skins off. Then into the bean pot they went. We made quesadillas with Hot Bread Kitchen tortillas (they make their own masa from scratch!) and a mozzarella & sharp cheddar blend from Millport Dairy, then served them with the beans & squash over top, and sprinkled scallions and cilantro from last week. 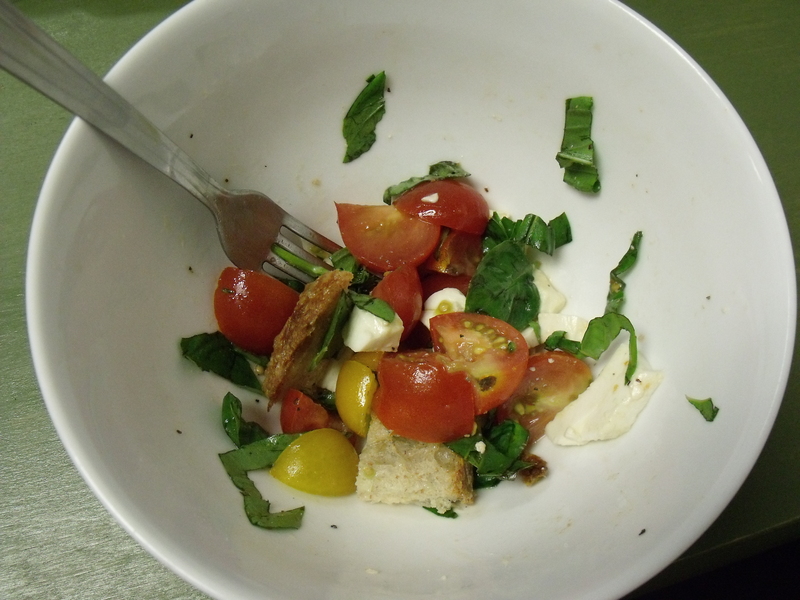 For lunch the next day: A tomato bread salad, using tomatoes, scallions, and basil. I sliced up tomatoes (supplemented with a couple sungolds from our back yard! ), drizzled them with a smidge of balsamic, tossed in some Hot Bread Kitchen bread (check it out, these are life-changing loaves), and topped with scallions. I was so excited to eat this salad, I almost didn’t get a picture of it! That night we had dessert for dinner because Wilford Brimley doesn’t scare us. Our vanilla spiked plum galette used almost all the plums. We sliced the fruit and then tossed it with a mixture of vanilla, cornstarch, lemon juice, sugar and a pinch of sea salt. Then we threw them in the crust–the recipe called for placing each one, but my patience (low) and excitement for dessert (high) scuttled that plan pretty quickly. A nice thing about galettes: you can put anything in them! They can go sweet or savory and are super forgiving. I did a really awful job making this crust, for example. 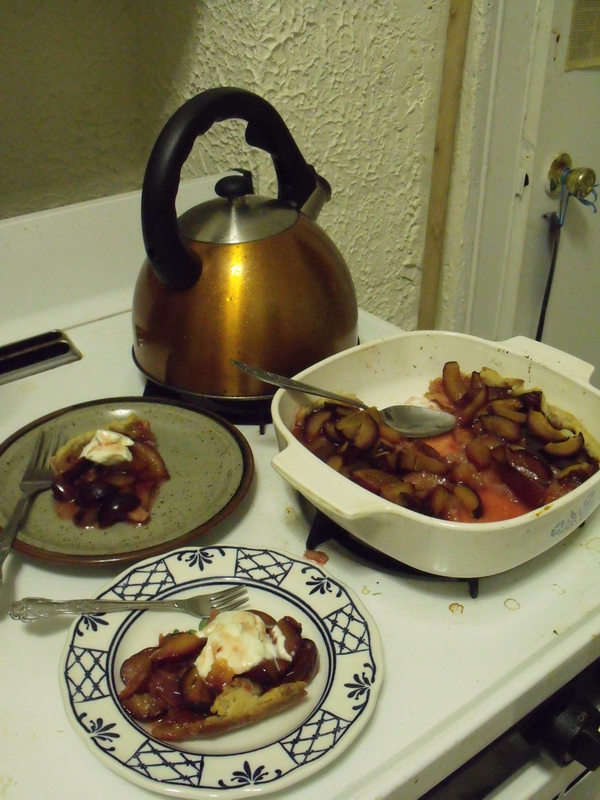 It was flimsy and crumbly and I was worried it would fall apart and leak delicious plum juice all over. So I just plopped the whole thing in a casserole and baked it that way. Certainly not a traditional galette, but just as delicious. We served it with a dollop of creme fraiche. We spent the weekend in Rhode Island visiting parents where we continued another CSA tradition of always bringing the rest of our share with us wherever we go. 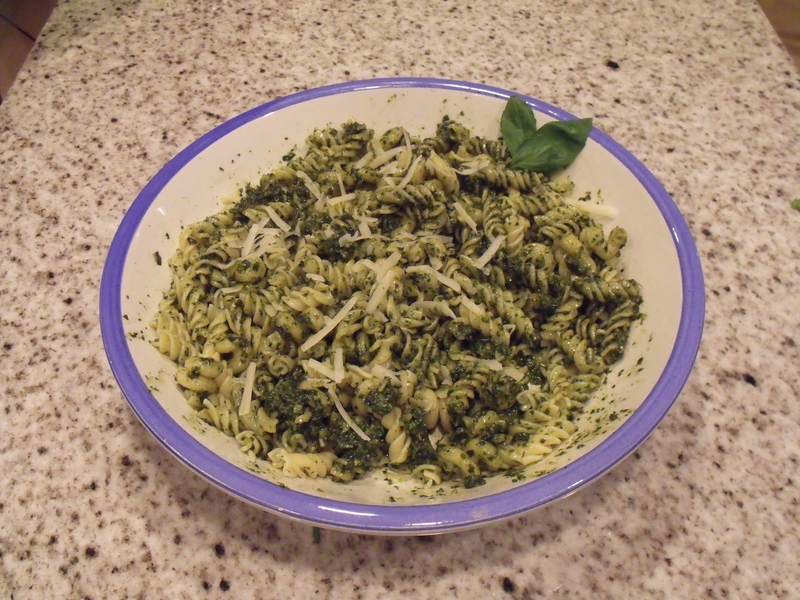 Ben’s mom turned the rest of our basil into pesto and we had delicious pasta and artichokes. A note about pesto: I went to an herb class at the Brooklyn Kitchen in which I learned that if you blanch the basil leaves, your pesto will taste even more amazing than usual. AND it will keep that bright green color even after you put it in the fridge. The rest of the share went like this: we devoured the peaches, over the sink because they were ridiculously juicy (and amazing). The berries and a couple plums were tossed with Ronnybrook milk (our favorite dairy) and eaten for breakfast. Eggs were fried and then eaten over leftovers (a braised swiss chard with cilantro & then again with black beans & cubanelles from taco night). The radish greens I sauteed with garlic and ate with, you guessed it! another fried egg. The radishes were sliced up and snacked on with cilantro hummus that we had made last week. We’re big fans of pureeing herbs in with our hummus–it turns bright green and is a great way to use an excess of say, cilantro, if you happen to have some. And then we have grand plans for the few remaining veggies: Celery I’m not a huge fan of by itself, so I’ll cook it with parsley that I froze in bundles the last time I got it and some carrots, onions, and kale stems to make a really good veggie stock. The lettuce we cleaned and froze right off the bat and will make into lettuce soup (recipe below) in the Fall when we’re ready for something hot and potatoes are bountiful. salt & pepperSaute the onion & garlic in olive oil. Add potatoes & water. Bring to a boil & simmer 10 minutes. Addlettuce, simmer another 7 minutes. Stir in balsamic, herbs, S&P. Blend. Eat. Yum.Hope you’ve enjoyed reading a little bit about how we used our share. In our experience it’s been more than enough for the two of us, and has always been delicious to boot.